Welcome to The Cottage Shop! Limoges Boxes have always been a treasured tradition at the Cottage Shop. Since 1985, when we mailed our the first printed catalogue, we already had one of the best Limoges Boxes Collections you could find in those days. The Limoges tabatieres were in style and the traditional roses or floral designs were the way the simple Limoges boxes' shapes were decorated by our talented master artists in the city of Limoges, France. We start the New Year 2019 thanking our loyal customers for your support and with a special Limoges Boxes New Year 2019 Sale! 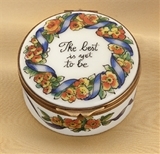 You do not want to miss the best prices on Limoges boxes while they last. Happy New Year 2019 and Happy Limoges Boxes Big Sale shopping at The Cottage Shop.com. Before Valentine's Day, we would like to bring you an old time favorite: our Limoges Red Telephone box with a message: I just called to say I Love You. 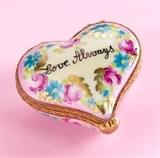 This Limoges box has been in our collection for 4 years and is a classic Valentine's Day gift. 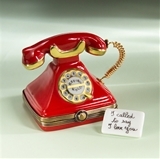 Please take a look at our Limoges red telephone with Love Message Box . We have started this New Year 2018 with a great introduction that many of you will love: Downtown Abbey gifts and collectibles have arrived at The Cottage Shop! With St Patrick's Day just around the corner, we would not want you to miss our Ireland Glass Stein with Pewter Lid at a great price as well as our Exclusive Ireland Glass Father and Son Stein, both in stock for immediate shipping at promotional prices until the end of July 2018. If your Irish Celebration calls for a French Limoges St Patrick's Day Box, please visit our Limoges St Patrick's Day Boxes at great discounted prices. You will find many exclusive Limoges St Patricks' Day Boxes on Sale now. And we could not forget our lovely collection of Irish De Carlini Italian Glass Christmas Ornaments: Our De Carlini Irish Man with a Clover ornament and our traditrional De Carlini Irish Girl ornament. We invite you to celebrate the birth of the famous Parisian Eiffel Tower with many Limoges Eiffel Tower Boxes to choose from: Limoges Eiffel Tower on Paris Landmarks Box, Limoges Eiffel Tower Paris by Night Postcard Box, Limoges Eiffel Tower Base Painting on Easel BOx, Limoges Eiffel Tower and Arc de Triomphe Suitcase Box. Brand New Limoges Mother's Day Boxes have arrived at The Cottage Shop to celebrate Mother's Day with a lasting treasure: a French hand painted Mother's Day Limoges porcelain box. The month of May is a very important month in the history of the liberation of Europe, VE day. The Cottage Shop is pleased to present our exclusive Limited Edition Winston Churchill German Beerstein with Pewter Lid. On May 13, 1940, a few days after Winston Churchill became Prime Minister , he met with his cabinet and said: " I have nothing to offer but blood, toil, tears and sweat". Brand new Limoges Christmas and Holiday Boxes for the Holiday Season 2018 have arrived at The Cottage Shop! 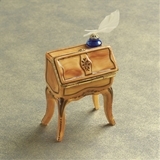 You do not want to miss our new Limoges boxes additions on our Limoges Christmas Village Boxes section. For the traditional collector, we are bringing back our exclusive Limoges Merry Christmas Cupcake Box a real sweet delight to surprise your friend with a Limoges box gift. If you would like to give a child a memorable and unique Limoges Christmas box, please takle a look at our exclusive Limoges Christmas Teddy Santa Cupcake Box. For a child of all ages, we can suggest our Limoges Teddy Santa Box with gifts. Another great exclusive Limoges box is our Limoges Saint Bernard Dog with a Santa Hat Box. For the religious Collector, we invite you to take a look at our Limoges Nativity in Belen Box as well as our Limoges Manger Box and Limoges Nativity in Egg Box. For the Limoges Angel Boxes Lovers, we have an exquisite collection of Limoges Angel Boxes, a fine and exquisite selection of the best Limoges angel boxes, some of them exclusive to us. You will find the best Limoges Christmas boxes at The Cottage Shop in order to delight yourselft with Limoges Santa Boxes, Limoges Snowmen Boxes and Limoges Christmas Trees Boxes for the season. If the occasion calls for a New York Holiday Celebration, please take a look at our Limoges Holiday Performance Girls Box. Starting now, you do not want to miss our Limoges Super Sale! Please look at our Limoges Super Sale Boxes! Brand new Limoges Easter Boxes have arrived at The Cottage Shop!. You will find a great selection of Limoges 2018 Easter Boxes: Limoges Easter Rabbit boxes, Limoges Easter Basket Boxes with hand painted Easter Eggs, Limoges Easter Chicken Boxes, Limoges Chocolate Eggs with Rabbits Boxes, our exclusive Limoges Pink Rabbit Cupcake Box with a Limoges porcelain Heart,Limoges Rabbits Painting Chicken Boxes and our traditional Limoges Easter Carton of Eggs boxes. For the elegant and super Limoges Easter Box Gift, you may want to consider our Limoges Imperial Easter Decorated Eggs Basket Box, available in turquoise or pink, both equally beaufitul. For the Limoges boxes historical and art fan, we have recreated the unique Faberge style Easter Egg Collection boxes. 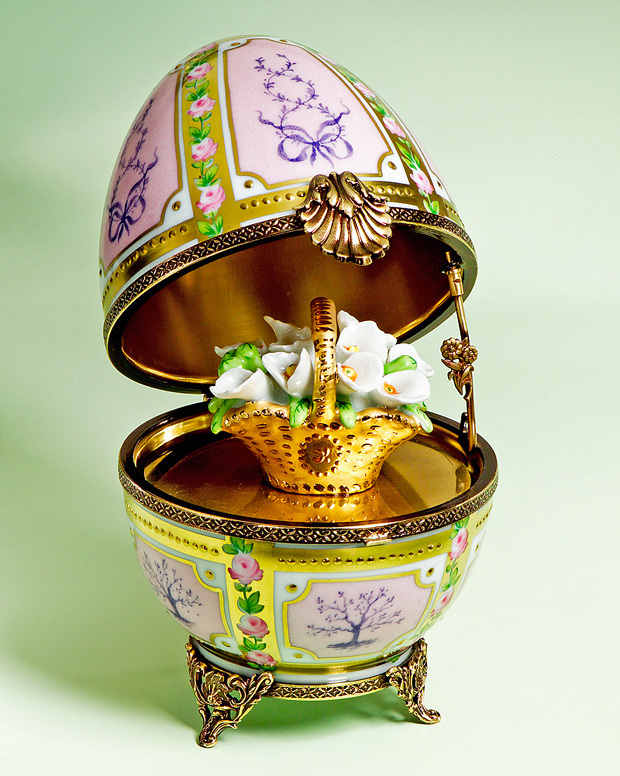 Please visit our Limoges Imperial Family Faberge Style Eggs Boxes. Our first introduction has been the Danish Jubilee Faberge StyleTsarina Easter Egg Box. Right on time for Easter, brand new this year, we are pleased to present to you the Faberge style Limoges Tsar Egg Box and the Faberge Style Tsarevich Egg Box. All these three Limoges high quality Egg Boxes are a limited Edition of 250 worldwide, from the exquisite Limoges Marquise de Pompadour Boxes Collection, only available at The Cottage Shop. Specially, at this time of the year, you may want to take a look at our Big Limoges New Year Sale Boxes while they last. Great Limoges boxes at $99.00 and under while they last... You do not want to miss our grest selection of Limoges heart Boxes, Limoges Romantic Boxes and everything you can give to your special person or make a very special Limoges box gift with a Limoges Valentine Box! 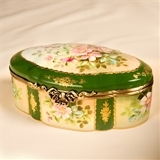 You will find a great selection of Limoges boxes for your special gift giving. Quantities are Limited. All our Limoges Sale Boxes are Brand New and as usual are hand painted buy our artists in the city of Limoges, France. Limoges Boxes made a total fashion transition during the late 80s and it became so trendy to have a cabinet or shadow box in many places of your home housing the most unusual Limoges hand painted porcelain boxes. From Limoges Traditional Boxes with roses, to Limoges Fruits and Vegetables boxes, each Limoges collection was started to have its special accent. For the Limoges boxes gift givers, we always had a big variety of Limoges Heart Boxes and Limoges Gift Boxes. Many of you remember the first time you bought or received as a gift a Limoges Box, a Limoges Happy Birthday Cake Box, a Limoges Wedding Box or a little later a Limoges Baby Box. 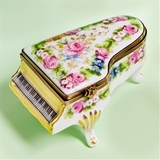 Years went by and the sophistication and creativity of the Limoges porcelain boxes molds had no limits. From Limoges Animal Boxes to Limoges Monuments and Limoges Boxes from around the world, almost anything that could be recreated was done into a Limoges handpainted porcelain box. All these new ideas in the Limoges creative revolution were made for the USA market. Limoges Chamart Boxes have represented the artistry and creativity of the best Limoges box from the 1970s on. Other Limoges brands as Limoges Artoria Boxes, Limoges Chanille Boxes and Limoges Rochard Boxes came after that.As usual, we are pleased to have a great selecion of them on our web sites and catalogues. In most recent years, and after having visited the historical archives of the city of Limoges, the Sevres and Versailles museums, a historical and artistic collection was created in France. The Cottage Shop is honored to present the exclusive Limoges Marquise de Pompadour Boxes Collection for the refined collector. This collection was made possible with the help and guidance of the Great Grand Daughter of the Countess D' Aubervilliers. Only the best commissioned artists are chosen to decorate each one of the Limoges Marquise de Pompadour Boxes. It is a great honor in France today to be creating a new mold or theme for this super Limoges Box Collection. We invite you to take a look at our Limoges Versailles Palace, le Chateau de Versailles Limoges Box, created with the help of historical architects and Parisian historical sculptors from the Louvre museum. After 8 months of work, the first Limoges mold of the Palace was born, perfectly scaled down with a level of detail that came from antique drawings and maps before the French Revolution until our days. Limoges Limited Edition boxes are created every year at The Cottage Shop, working very close with the Limoges best artist decorators. Please take a look at our Limoges Neuschwanstein Castle Box, our Limoges Vatican Dome Box, our Limoges Angel with Dove Box, our Limoges Irish Pub Box. Limoges New Limited Edition Boxes arriving at The Cottage Shop in 2018...Limoges Limited Edition Echmiadzin Armenian Cathedral Box, a treasure of Christianity and history made into a Limoges box with superb detail. Limoges Macchu Pichu box and Limoges House of Shakespeare box. Limoges Cupcakes Boxes Collection and a very special Brand new Limited Edition Box has arrived at The Cottage Shop: our Exclusive Limoges Halloween Train Box, a set of 3 pieces , each signed and numbered by our French specially commisioned artist decorator. You do not want to miss our Limoges French Halloween TRain Box for your Halloween Limoges 2013 collection boxes! Our Limoges Halloween House with a Ghost Box and Brand New this year: our Limoges Halloween Gift Shop with a Witch and a Ghost Box make a great addition to your Halloween Collection. Limoges Halloween Party Box , Limoges Halloween 3 Black Cats Halloween Night Dance Box will be arriving on time for Halloween as well as Limoges Halloween Eiffel Tower with Witch and Ghost Box and a Limoges Eiffel Tower with Spiders Box. Totally new this year, our Limoges Irish Boxes found at the Limoges Irish Corner Boxes where four leaf clovers for good luck wishes mix with many green decorated Limoges boxes including Limoge irish Baby Boxes, Limoges Limited Edition Irish Pub Boxes with Beer Bottles, a Limoges Irish Telephone with an Irish Greeting, a Limoges Irish Green Hat Box with a loose Four Leaf Clover, a Limoges irish Lamb Box and a Limoges Irish Dog Box with a Green Bone, a Limoges Irish Birthday Cake Box, a Limoges Irish Baby in a Green Buggy Box and our LImoges Irish Boot with a Celtic Cross and a Lamb. If you love history and rich elegance, you do not want to miss our Limoges History Boxes with a Limoges Napoleon Bust Box and Limoges Paintings on easels Boxes of the Marquise de Pompadour and other Limoges paintings and books Boxes of USA and European historical famous people. For the Literature fans and Writers, we invite you to visit our Limoges Book Boxes Section where you will find Limoges Book Boxes, Limoges Secretaire Desks Boxes with a Fetahr Quill Pen as in the old romantic days and famous Limoges Books of Literature Masterpieces: Limoges Les Miserables Book Box to remember Victor Hugo and Limoges Pride and Prejudice Book Box with a loose Pencil to remember Jane Austin. Please take a quick look at our exclusive Limoges Cosette Miserables Book Box. For our serious art collectors, we are pleased to present a great selection of Limoges Treasure Chests that will decorate the center of your tables or any end table in your home. The patterns that decorate our Limoge Treasure Chests are a combination of 200 years ago art and technique together with the most romantic way of painting roses found in Limoges today. Among bigger pieces, we also found some antique white molds of porcelain that had not been painted and managed to recreate bigger Limoges Boxes, not hinged. in the early 1900s style of the Limoges Statuetted and Limoges Figurines. Please take a look at our Art Deco Lady Statuette Figurine Box , our Monkey and Dog Friends Statuette Figurine Box and our Limoges British Guard Statuette Figurine Box. You will be taking home a piece of French Art History from the 1900s. The year 2000 and the Millenium times we celebrated are long gone but you can bring them back into your Limoges box collection with our brand new Limoges Year 2000 boxes which have been kept sincethe year 2000, Limoges boxes that are not made anymore and only available for our special Limoges porcelain boxes collectors at The Cottage Shop. We always have many Limoges Boxes on Sale. All our Limoges Boxes are Brand New and come directly from the Limoges artists from the city of Limoges, France. Our Limoges Boxes at Special Discounted Prices give you the chance to buy a Limoges box at a great price to enchant a new collector with a limoges box gift. De Carlini Italian Glass Christmas Ornaments have been the magic part of the Cottage Shop since 1985. Every year, we work together with Luca and his team in Italy to create new and exclusive Mouthblown Italian Glass Christmas Ornaments in the unique manner only the Soffieria De Carlini knows to artistically produce and decorate for 3 generations. New this year, from the De Carlini Italian Ornaments Collection, you will see arriving to our site and catalogues very soon, a marvelous selection of De Carlini Italian Glass Christmas Ornaments to add to your collection. New De Carlini Limited Editions Christmas Ornaments and a De Carlini Vintage Collection of Christmas Ornaments, a hidden treasure we found at their factory dating back from the 70s 80s and 90s. Please take a look at the De Carlini Fairy Tales Christmas Ornaments, De Carlini Aliens Christmas Ornaments, De Carlini Elegant Ladies Collection and De Carlini Professions Christmas Ornaments. Some Santas from around the world will also be coming soon. The De Carlini Sherlock Holmes Limited Edition Christmas Ornaments, De Carlini Shakespeare Christmas Ornament, De Carlini Dante Christmas Ornament, Romeo and Juliet Christmas Ornaments are adding to the magic collection the Madonna of Guadalupe Christmas Ornament, a magnificent ornament of Our Lady of Lourdes to celebrate Christmas and and Irish Happy Man Christmas Ornament. To celebrate the beauty of the Marquise de Pompadour and her enlightment to the court of France, this year, brand new, we have a De Carlini Marquise de Pompadour Christmas Ornament that will go very well with your De Carlini French King and Queens Christmas Ornaments. We would not want to forget our De Carlini Ltd Ed Pope Jean Paul II Christmas ornament,in such an important year for him, our De Carlini Mermaid christmas Ornaments Collection and our De Carlini Harry Potter ornament among our favorites for all ages. German Beersteins are also an important part of our collections at The Cottage Shop. Please take a look at the tradirional German Beer Steins, the Whimsical Beer Steins or the general Gift section of Glass Beer Steins at a great price for every day gift giving occasions. Foir the serious beer stein collector, we invite you to visit our Lord of Crystal Beer Stein Collection, a artistic creation using Bohemian crystal and German artistry . Murano Italian glass Sculptures have been brought back at The Cottage Shop with a large selection of Murano paperweights, Murano Glass Sculptures with Fish or Murano whimsical clowns and animals. In the world of the porcelain and miniatures, we invite you to visit our German Reutter Porcelain Miniature Shadow boxes, our Italian miniatures shops and rooms, a real delight from the past still recreated in our days by very few artistic and patient artisans from the side roads of Europe. British Teapots, Crystal miniature collectibles and much more will be soon arriving at The Cottage Shop. We would like to make your shopping experience as pleasant as usual. Please do not hesitate to contact us with any comments or suggestions at 1-800-965-7467. We thank you for your support through the years and invite you to visit the pages of our sites and catalogues with great enjoyment.